The hard seeded annual legume, biserrula has been embraced by farmers as a handy break in the cropping system but livestock grazing the pasture can be affected by photosensitisation. To inform producers of best practice in using this legume pasture, researchers from the Graham Centre for Agricultural Innovation have produced guidelines for sheep producers. 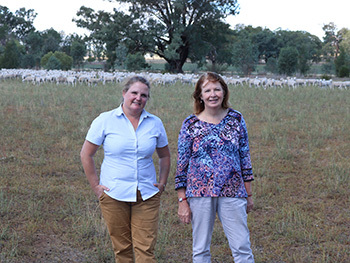 The guide, ‘Understanding photosensitisation in sheep grazing biserrula pastures’ follows grazing trials led by Professor Leslie Weston and Associate Professor Jane Quinn from Charles Sturt University (CSU) in Wagga Wagga. Professor Quinn said “Biserrula photosensitisation occurs when animals ingest biserrula plants that produce photodynamic chemicals causing direct damage to skin in the presence of sunlight. In some cases severe damage to the skin can occur with resulting fleece loss. “The initial signs of photosensitisation can arise quickly, within as little as three days of sheep grazing pastures. Producers should become familiar with the range and severity of symptoms so they can act quickly to minimise the number of animals affected and the severity of symptoms. Sheep breed and genotype, along with underlying health issues such as worms or liver fluke, have also been shown to affect the incidence and severity of photosensitisation. CSU Professor Leslie Weston said the grazing trials also highlighted the impact of other species in the pasture. “We found reduced severity of photosensitisation in sheep grazing pastures with 10-30 per cent annual ryegrass or mixed stands of biserrula containing significant percentages of other forages, although incidence was never mitigated completely,” Professor Weston said. “Another important thing to note is that photosensitisation was not recorded in any animals in the trials when grazing fully dried biserrula pasture, regardless of the percentage of biserrula in the sward. The research was funded by Meat and Livestock Australia (MLA) and the guide can be downloaded here.